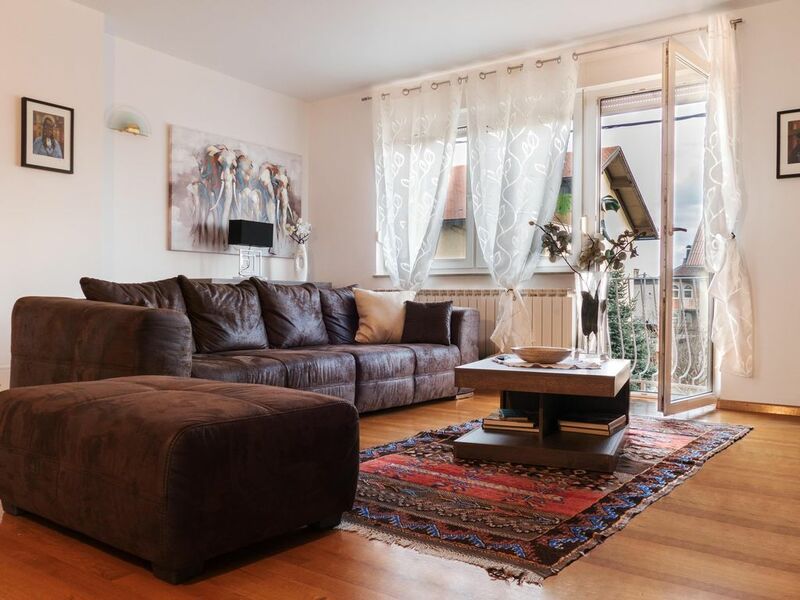 This apartment has everything you need for a holiday in Zagreb. With two bathrooms and three bedrooms there is plenty of room for four people. It is on the first floor and is in a quiet area of the city, close to shops, small restaurants and the tram line. We were able to be in the city in 20 minutes. We could cook meals in the flat or we could go out in the evening using the tram service which is both reasonable in price and frequent. The local shops had everything we needed for breakfast and the occasional evening meal. We stayed for a week as we had not visited Croatia before and we had plenty to do in that time. We invested in a 72 hour Zagreb Card, visited several museums and took advantage of the included tram tickets. We also crossed the border in to Slovenia and visited Ljubljana which was a long day but well worth the trip. We would offer two pieces of advice based on our week - research the taxi prices and take care that the driver uses the correct address. Secondly, it rained almost the whole week so bring a raincoat in April! Hermina and her son Bruno were welcoming and very helpful. Both spoke English and were able to assist with our travel intentions in Zagreb. The apartment was secure and well appointed, up two flights of wide stairs so access was easy. The main bedroom has an ensuite and there is a second family size-bathroom. The laundry is part of the ensuite. The apartment is located about 400m from coffee shops and a market - both fresh food and a supermarket. The kitchen was well appointed and modern. There is parking for one car on the property. Trams to and from the centre of town are located about 200m from the apartment. We would use it again. We stayed in this lovely large suite for two nights. It was even better than pictured. Lots of towels, shampoo etc. It had three lovely bedrooms with comfortable mattress and nice linen. It had two bathrooms, the one disadvantage was that one of them was off the largest bedroom, but for only two nights that was ok. It did have a bit of road traffic noise, but compensated with being only a block away to the tram. The tram was only 4 kuk if you by them at the little newspaper stand, which opens at 9:30 by the way, the ticket is good for 30 minutes once you activate it. About 20 minutes into town Center, certainly worth a visit. I would definitely stay at this place again.